Home » Football » In a CLASSIC letdown spot, the Jets WIN!!! In a CLASSIC letdown spot, the Jets WIN!!! The New York Jets had a BIG win last week and were BIG favorites against the Indianapolis Colts this week, if these were the SAME OLD Jets, they would have had a LETDOWN today, but these NEW age Jets had a BIG game to get to 3-3 on the season. 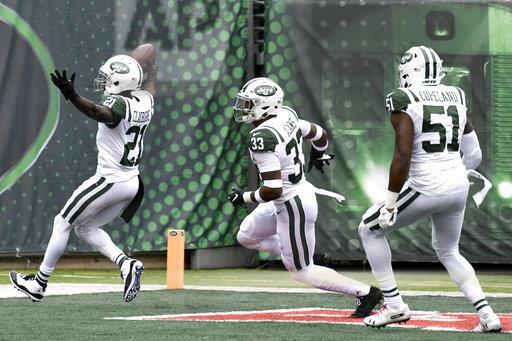 From within TWELVE seconds of the game, the Jets DOMINATED the Colts and WON the game 42-34. The Colts received the ball, but it took the Jets just TWELVE to OPEN the scoring on a GREAT catch by Morris Claiborne from a tip ball from Jamaal Adams and the MOMENTUM was set from that point on. On the ENSUING drive, the Jets had ANOTHER chance to INTERCEPT the Colts, but they DROPPED the ball and the Colts capitalized by going down the field and SCORING to TIE the game. The Jets offense had NOT even gotten on the field yet, but the game was TIED at SEVEN and the offense added a Field Goal to make it 10-7. The Colts kept the game close in the SECOND quarter and they had a 13-10 lead but the Jets scored THIRTEEN unanswered points in less than THREE minutes to close out the FIRST half and that was a BIG dagger for the Colts. Terrelle Pryor caught his SECOND Touchdown pass of the season, which is DOUBLE of what he did last season with the Washington Redskins. There were FIVE combined TURNOVERS in the FIRST half but the Jets had the lead in a SLOPPY first half and they added SEVEN more points to START the SECOND half and it looked like the ROUT was on. Jason Myers had a CAREER game kicking SEVEN Field Goals and helped the Jets get the WIN on the day they HONORED the 1968 team which WON the Super Bowl over the Baltimore Colts. EVERYTHING is going GREAT in Jet land as they WIN two games in a row for the FIRST time since Week 4-5 last season. There are NO real NEGATIVES from this game because the offense was GREAT, the defense BALLED OUT, and the Jets did NOT have any BLUNDERS in Special teams. They had TWO turnovers on offense today, I would like that number to go DOWN a little bit but other than that, they were really GOOD today. Giving up THIRTY FOUR points to a BAD team like the Colts is NOT ideal, but the defense made some KEY turnovers and HELD on to win. Next week, the Minnesota Vikings come to town, in what is going to be a DIFFICULT game for the Jets. I think they will be FAVORED in the game. The Jets are 3-3 right now, so they still control their OWN destiny, if they can WIN some games coming up than they can go 8-8, 9-7. This season was NEVER about winning games, it was about DEVELOPING the quarterback and it looks like through SIX wins of the season, they have found their FRANCHISE quarterback in Sammy Touchdowns.